For this tutorial, we will assume you are familiar with the Python language. Before you begin, we highly recommend you complete the Assembling the Gaffer Bot tutorial. With the built-in Python Editor, you can build and modify the node graph, test API code and syntax, return plug values, and query scenes and images. 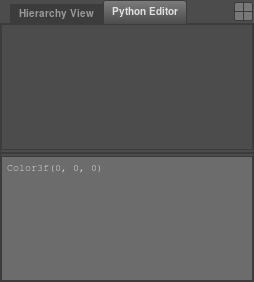 In the default layout, the editor is in the bottom-right panel, under a tab next to the Hierarchy View. Type print "Hello, World!" into the input field. Hit Control + Enter to execute the code. In the Gaffer API, each node is an instance (in the programming sense) of a class, with each class belonging to a particular Python module. In order to create a node sourced from a module, you will first need to import that module. 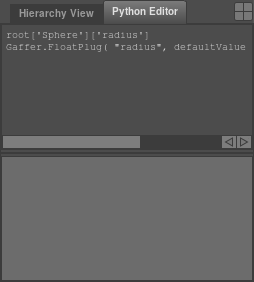 A list of each of Gaffer’s default modules can be found in the Node Reference. Notice that the node was added with the addChild() method to the root variable. The addChild() method is the core method for adding nodes and plugs to the node graph. The root variable references the root of the node graph. All nodes in the graph are ultimately children of the root. If you declared the node variable without adding it to the root variable, it would exist in memory (all variables in Python are objects), but it would not yet be part of the graph. Middle-click and drag a node from the Graph Editor (the cursor will change to ). 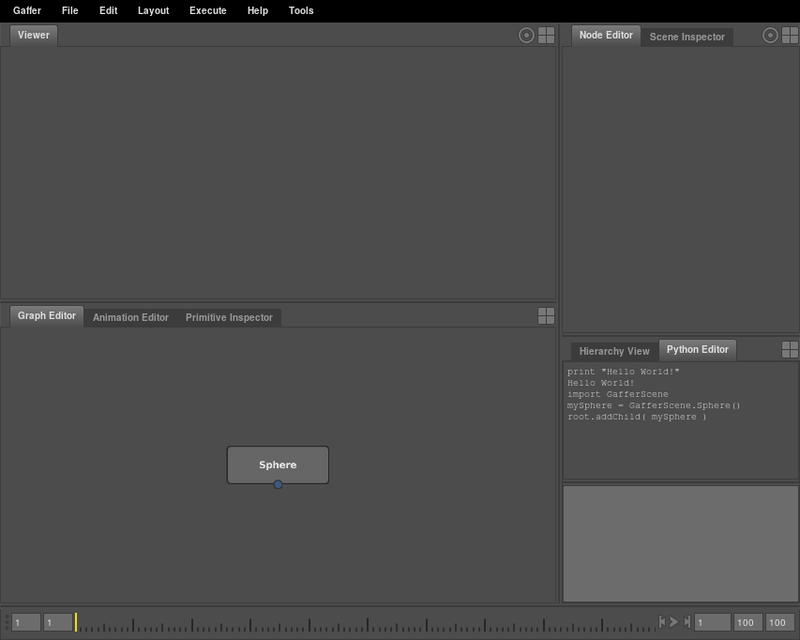 Release the selection onto the input field of the Python Editor. Since a node’s default plugs are created automatically, they have no assigned variables, so you will need to reference them another way. In the API, plugs in the graph (and also, in fact, the nodes and the root variable) can each be treated like a Python dictionary, with key-value pairs. When editing plug values, it is usually necessary to first reference them in dictionary syntax. Because Python dictionaries do not have built-in overwrite protection, you can accidentally and irrecoverably replace nodes and plugs with assignments that use existing node names, like root['Sphere'] = .... Use dictionary syntax with care. 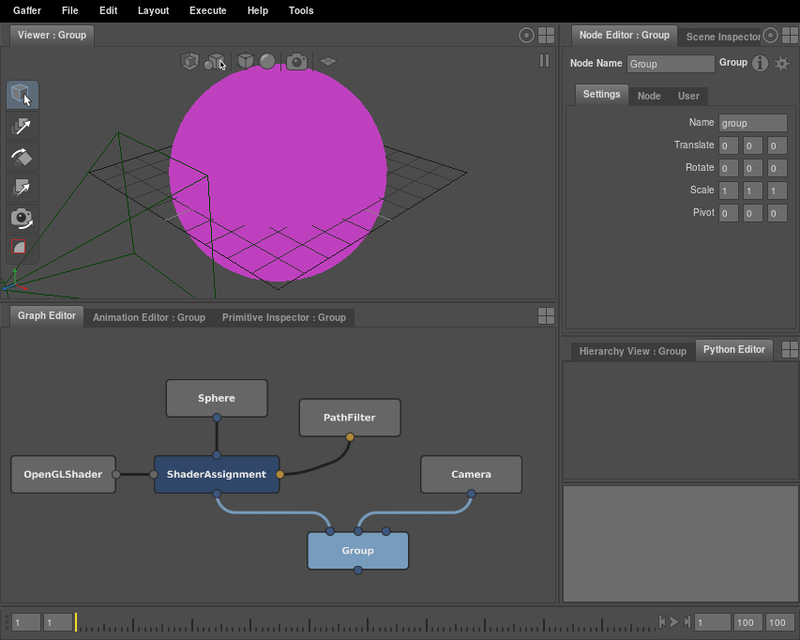 Select the Sphere node in the Graph Editor. Click and drag the label of the radius plug from the Node Editor (the cursor will change to ). Release it onto the input field of the Python Editor. A reference to root['Sphere']['radius'] will be inserted. This is identical to mySphere['radius'] from earlier. Notice how when you drag and drop plugs, the reference is formatted in dictionary syntax. Dragging and dropping plugs is a core technique when using the Python Editor. It can speed up your node graph editing and inspecting considerably. The above shortcut can also be very handy in regular use. For instance, if you need to know the type and format of a particular plug’s value, dragging it into the Python Editor will reveal it. The setValue() method edits plug values. It functions on plugs with both single and multi-element data types. When editing a plug with multiple elements, such as a vector, color, matrix, etc., you can either edit all the values at once, or one at a time. Editing all the values at once requires formatting the value in the type’s syntax. Most of the multi-element types belong to the imath utility module, so before you can edit them, you will first need to import it. In this next part, we will step you through the remaining plug edits for your node graph. For each of the following plugs you edit, you will see little to no change, because the nodes are not yet connected. Think of these steps as preparing the plugs. The above code is more advanced than what we have shown so far, but you will likely need it at some point when editing node graphs. Any time you edit a plug that can take multiple strings, you will need to format the strings as a list, with IECore.StringVectorData(). When using this method, remember to first import the IECore module. Nodes do not connect together: their plugs do. The setInput() method connects a destination plug to a source plug. 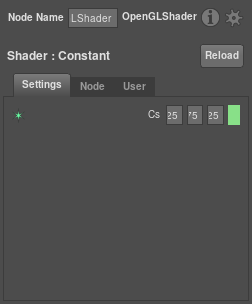 You are not limited to connecting the default plugs visible in the Graph Editor. The setInput() method can connect most pairs of plugs. For example, to connect scene node A to scene node B, an in plug of node B is connected to the out plug of node A. Scene nodes with an ArrayPlug input automatically maintain one free child, so that there is always at least one input available. Make sure to connect their child plugs in order: ['in'], ['in'], ['in'], etc. Connecting them out-of-order will return an error. As you probably noticed, the graph looks tangled up, but that’s a consequence of scripting a graph piece-by-piece. Correct this by selecting all the nodes, and then hitting Control + L.
When creating a node graph using Python, if you add the nodes, declare variables for them, connect them, and then add them to root all at once, they will automatically and evenly lay themselves out. In fact, that is essentially what Gaffer scripts do when loaded. That covers the most common methods and tasks when using Python to edit node graphs. As we have shown, you have the capacity to accomplish almost all interface actions in Python, demonstrating the power and flexibility of the API.